Stephen King is a true phenomenon in the world of publishing. One of the highest-selling authors of all time (with estimated sales of over 350 million), his stories have been adapted into over 50 films and TV series (not counting numerous shorts, sequels and original screenplays). So when someone like King decides to make a statement in regards to how a book is distributed, it makes a difference. He's decided to publish his latest, Joyland, as a paperback to give a boost to beleaguered bookshops. As he explains in his own words: 'I loved the paperbacks I grew up with as a kid, and for that reason, we're going to hold off on e-publishing this one for the time being.' Perhaps it's pure nostalgia, but King is enough of a draw to get his fans back into the shops. It might not stem the tide, but it's nice to see an author of King's stature thinking about the industry as a whole. Plus, if you did buy it as an e-book, you'd miss out on Glen Orbik's gorgeous, pulpy fully painted cover. As for the novel itself Joyland is a murder mystery rather than straight-ahead horror. The year is 1973 and a young Devin Jones is getting his first taste of independence as he starts a summer job at the Joyland amusement park of the title. We're soon neck deep in the world of carny folk, rubes and funfair rides and it's a colourful backdrop for an unsolved murder and coming-of-age story, as Jones learns there’s life beyond his first love. Essentially Joyland is a meandering crime thriller, but King can't resist adding a dash of the supernatural to proceedings, throwing ghosts and psychics into the mix. It's pleasingly different but still recognisably King. There’s that forward momentum that King has mastered so well. He’s a master of pace, alongside his customary detailed cast of characters. Joyland is wonderfully nostalgic and evocative, and he's created a world richly populated with a believable cast of eccentrics making for a totally engrossing slice of Americana. 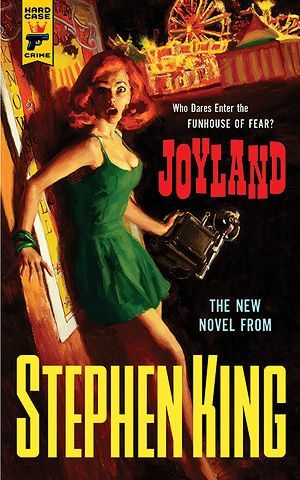 As with any author as prolific as King, there are some duds along the way, but Joyland is one of his best of recent years, perfectly balancing heartbreak and chills.